Muu Just Another Day is a new short platformer adventure game from miktar. The game is built around a character which I believe is cow or some animal that looks like a cow but can stand and walk on two feet. 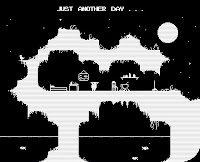 The game starts without a back-story other than the phrase "just another day" then you start walking and jumping til you are tricked into jumping down the first pitfall by the arrow pointing down. You respawn but from that moment on you promised to yourself that you will never follow the direction where arrows point ever. Anyways, this game said to be the first flash game from its author but maybe he's a wizard of some sort because he just made a great game. The music in it is good too, perfect background for a bull that dies a lot lol. Meanwhile, I've searched for Muu Just Another Day walkthrough so you guys don't have to and found this.